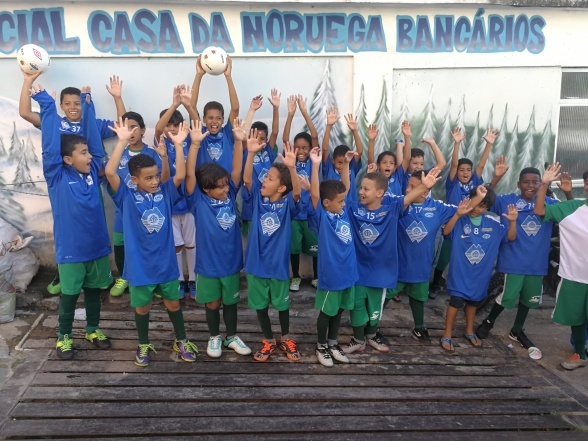 This month, Casas da Noruega celebrates 9 years as an NGO in Brazil. Throughout the years, the goal is still the same: to give new opportunities to young children and teenagers in poor local communities. Back in 2009, the social project drew a plan with the support of sport: to offer extra education activities at the community to keep kids busy studying and playing football and away from drugs and crime. In order to make this a reality, the NGO built a school and a football court, in Bancários, Ilha do Governador (Rio de Janeiro). Naturally, the football practice organized by the coaches Jair and Gilson got very popular among the students at the community. However, all boys and girls interested in being part of the football team must sign up and attend one of the classes at the school first. Since the beginning, the school have been offering English, Math, Music and Computer classes. Today, the school has 520 kids registered. Plus, many social activities were organized around the school: clothing campaigns donated by Norwegian private sponsors, health campaigns during dengue outbreak in 2016, several Easter and Christmas celebrations and also some special visits, like BES and Nasta. Meanwhile, as a result of the hard work and dedication of the sport project, Casas da Noruega brought the male football team to compete in Norway twice: in 2016 and 2017. In 2016, the boys won Norway Cup and Sandarcupen and last year, the team won again at Sandarcupen, a local tournament held in Norwegian city Sandefjord. The athletics team also came to Norway in 2017 to be part of the Veidekkelekene organized in Lillehammer in March. The male team finished in 2nd and 3rd in 4/60mts and Anna Júlia won the silver medal in 60mts. Casas da Noruega goals for 2018 is to keep up the sport, the social and the educational activities in poor community in Brazil focusing in new opportunities for the youth. Follow us on Facebook and Instagram to read more about our work!